Above: The Coles mural, a rare example of bicultural vision, is now more than 30 years old. It involved extensive consultation and community participation led by muralists Kaye and Bob Kessing. 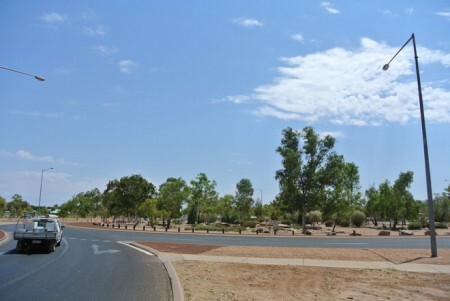 Driving from the airport into town there’s not too much evidence of Alice Springs acknowledging, let alone celebrating its character as a place where two very different cultures meet and – in their better moments – aspire to get along. Without this, can Alice Springs be considered worthy of playing host to a national Indigenous cultural centre? Over the years, a lot of good work has been done but not enough of it has left its stamp on the town’s public face. 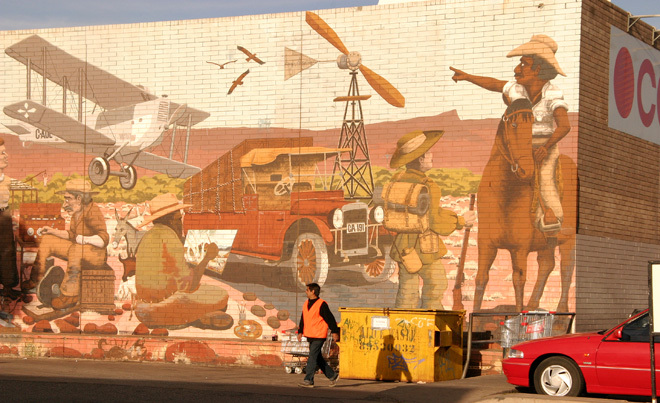 What matches, for instance, the bicultural breadth of vision expressed in the Coles mural facing Railway Terrace? That work is now more than 30 years old. If the town is to make its case for the investment a national Indigenous cultural centre would require, it should surely look to, in the immediate term, the multiple smaller but significant ways in which Aboriginal presence and cultural achievement can be acknowledged in the town’s public spaces. And importantly, if only for the sake of a more harmonious community, shouldn’t it embrace more expressions of diversity, of bicultural partnerships and collaborations, of visions for a mutually rewarding joint future? Instead, the opposite is mostly the case. Left: Opportunity begging – the vista (Tom Brown Roundabout) as you come through The Gap. The airport does its bit – and has done for a long time. It installed some very fine works by Aboriginal as well as non-Aboriginal artists from the start, following up recently with the development of an Aboriginal art branding for its building. It also hosts a greeting to visitors from the native title holder body Lhere Artepe. 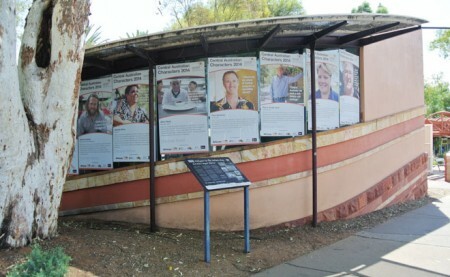 These are the first signs you see as you walk into the terminal – you are welcomed to Central Arrernte country in Arrernte, translated then into a number of languages. But you will not see anything like this again. There’s very little bilingualism in town, and what there is, is so discreet it’s as though whoever put it there hopes that nobody notices. 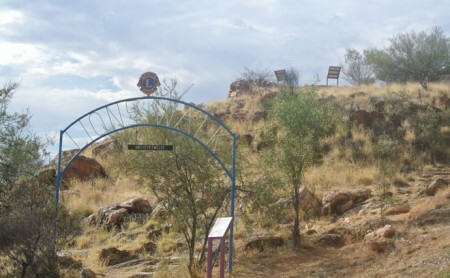 Right: The tiny suspended sign gives an Arrernte name, Untyeyetwelye, that is presumably for the hill otherwise known as Anzac Hill. In the tourism information pitches around the place the neglect of Aboriginal presence and achievement is quite shocking. 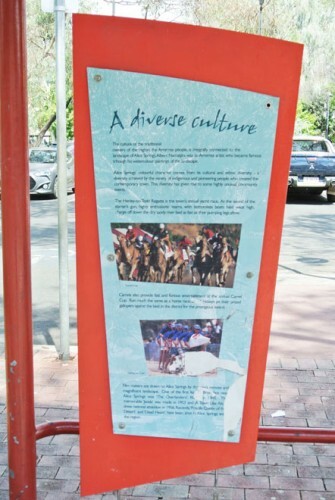 In the information bay across the road from the Yeperenye shopping centre, under the heading “A diverse culture”, what do we get? A photo of horse-racing and another of the Henley-on-Todd (below). Lip service is paid to Arrernte traditions and ethnic diversity but that is not what is represented visually. Next to it is a panel headed “Heritage, culture and the arts”, which suggests a walking tour around town. Not one destination on that tour is a site of Aboriginal heritage. 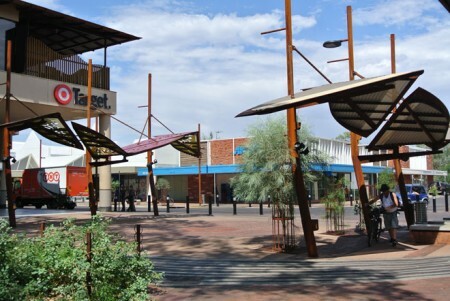 No mention either of what is effectively an Aboriginal art precinct in the mall with Papunya Tula Artists in pride of place, just a stone’s throw away. This is despite the fact that Aboriginal art over the last four decades has – more than any other cultural activity – put Alice Springs on the national and international map. People following this itinerary would get to experience Aboriginal art at its final destination, the Alice Springs Cultural Precinct, but the panel doesn’t tell them so. A panel about “Local characters” is the third in the bay. There are potted biographies of six ‘characters’ and finally, an Aboriginal artist, Emily Kame Kngwarreye, makes it onto the list. As wonderful an artist as she was, and as famous, I wonder about this choice as she is not someone primarily associated with Alice Springs, but rather with her Utopia homelands. And why are people of high achievement represented as “characters”? It’s as though we are afraid to own achievement and have to dumb it down. These signs are already a few years old (and showing wear) but there’s a new generation of “characters” celebrated in another pitch to tourists, this time on the façade of the former, now vacant, premises of Tourism Central Australia (TCA). 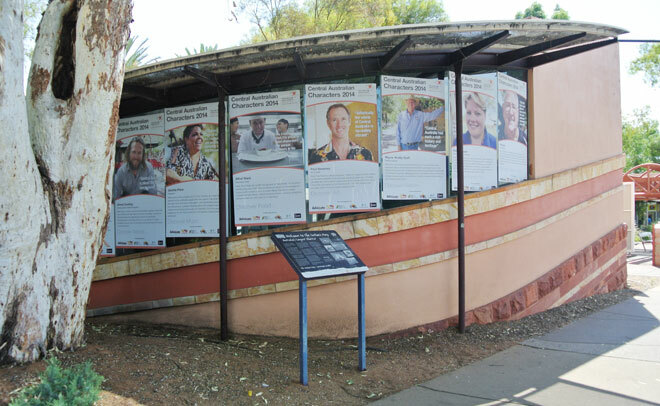 “Central Australian Characters 2014” is a project of TCA, supported by the Centralian Advocate, the Town Council, CAAMA, Tourism NT’s “Do the NT” campaign, Coleman’s Printing and Sun FM. It’s been there a little while, but I only recently stopped to take a closer look (a section is shown below). There are 15 characters represented in 14 images. At a glance, they are overwhelmingly white men. The count, to be precise, is 11. There are only two women. One of them is Jacinta Price, identified as “songbird”. The potted bio mentions something about the multi-culturalism of her extended family but strangely, there’s not a word about her Warlpiri heritage, always a point of strong identification and pride for Price. Ian Conway is among the men, described as a “philanthropist and station-owner”. Once again, no reference to his Aboriginal heritage although the text describes “a deep spiritual connection to the land and its people”. This man is a native title holder for Alice Springs. Australian law recognises his special status. But local lore cannot? There is just one man identified as Aboriginal in the whole display, Jerry Kelly, described as “Warumungu Man”. Perhaps, you might think, that the project wanted to generally skirt this kind of identification of people, but in the very next panel you see that this explanation does not stand up, with one Liam Doherty identified as “English lad”. Bizarrely the opportunity to feature an Aboriginal artist is missed in the ‘Discover art’ panel. Instead we see Paul Sweeney, a man best known for his role as manager of Papunya Tula Artists. Of course, ‘discovering art’ in Alice Springs is not limited to discovering Aboriginal art. For a small town there’s a wide range of arts experiences on offer, but if you were going to make one representative image, wouldn’t it be of an Aboriginal artist and artists? Or even if it were the case that a photograph of an individual artist was not possible, couldn’t the setting of the image have referenced Aboriginal art? But there’s no art of any description in the photograph. Recent work in Todd Street North (left) has done something to restore balance in Alice’s cultural order, but until interpretive material is made available, visitors and indeed many locals are unlikely to appreciate its significance. The entire town area, situated as it is in an anciently inscribed cultural landscape, could be – even without a dedicated building and collections – an Indigenous cultural centre like no other. This is an area of great opportunity, which deserves some deep local thinking and creativity. Cultural work done over the years – by artists, writers, thinkers, designers, producers, and performers – lays the foundation for this. 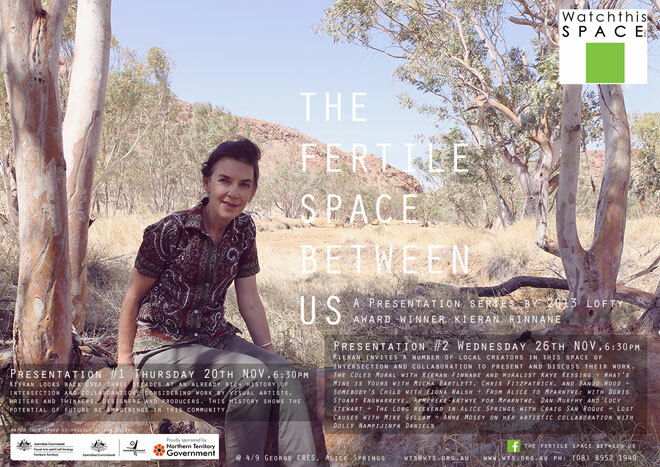 I will be looking at its history in greater detail tomorrow night (Thursday, November 20) at Watch This Space in the first of two presentations, titled The fertile space between us. The second presentation (Wednesday, November 26) invites local creators in this “fertile space” to present and discuss their work. The program includes a brief history of the Coles mural and discussion of its development with one of the muralists, Kaye Kessing. All welcome. Watch This Space is at 9 George Cresecent. 6.30pm for 7pm start. Full program here. Below: Invitation designed by Alex Hullah. There use to be a great building right in the middle of Alice built by a Dutch man. It was shaped like a two story silo which inside was one massive canvas 360 view of Alice springs underneath was a wonderful collection of all the early history and diversity of Alice Springs. Sadly the building and all its contents wer lost to fire some years ago. Forgotten the name of the building. Fabulous article. Your voice and opinions are so necessary and valuable. Thank you! Aboriginal art isn’t as popular or collectible as it once was. Dot art has been done to death and despite some effort at reviving the Namatjira watercolour school, I don’t think that is going to take off either. Some Aboriginal artists are now doing mainstream stuff in preference to traditional art. A generational change means a change of taste. Younger people don’t seem to decorate their homes like we did. They don’t buy original artwork. Alice Springs is also changing and becoming more motor sport and event orientated. It reminds me of my visit to Florence, Italy – the Renaissance produced magical stuff … but it’s something that doesn’t repeat. I suspect the time of the great Namatjira art school and the famous dot painters will soon be relegated to history. And no amount of wishing (or financial investment) will bring those times back. What is past is past.